It’s the busiest week of the year for craft breweries. We toast their efforts to promote the culture of craft beer. Christmas. Thanksgiving. Bastille Day. Certain times of the year hold a special place in our hearts and minds (and, oh yeah, our stomachs). At Craft Brewing Business, American Craft Beer Week (ACBW) is more than just one day. It’s an entire week of celebrations dedicated to craft beer — and it’s like having Christmas, Halloween and St Patty’s Day rolled into one delicious-long kegger. And it’s not just us. There are similar celebratory craft beer events are planned throughout the 50 states. From May 13-19, craft beer connoisseurs and beginners alike will come together for the eighth annual celebration of ACBW. With the tagline “Big Week, Small Breweries,” ACBW is an opportunity to toast the more than 2,400 small and independent American craft brewers who continue to make the United States the world’s most badass brewing destination. New for 2013 is the American Craft Beer Week National Toast. We did a similar toast in early May 4, celebrating one of America’s fastest growing hobbies — National Homebrew Day. That worldwide event brought together thousands of homebrewers from around the globe, all brewing the same beers, and highlighted by a toast at noon Central Time on May 4. For the first time ever, ACBW will be commemorated by a simultaneous toast. 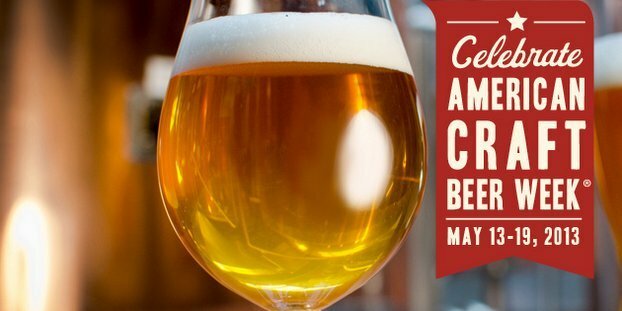 At 8:00 p.m. ET/5:00 p.m. PT on Thursday, May 16, small brewers and craft beer lovers nationwide will raise a glass of their favorite craft brewed beer to toast ACBW and the delicious beer that it celebrates. To find a toast location near you, visit the official American Craft Beer Week events page, hosted by CraftBeer.com. Untappd, the mobile-based social network that connects breweries with craft beer lovers, is also offering an American Craft Beer Week Badge for users who check-in during ACBW events. We pledge our support to small and independent craft brewers of this nation. Coast to Coast Toast to Craft Beer with Stone Brewing Co.; Westerly, R.I.
Coast to Coast Toast to Boulder’s Craft Beer Phenomenon; Boulder, Colo.
Mayflower Brewing Co. 4th Annual Open House; Plymouth, Mass. Anaheim Brewery Founder’s Day; Anaheim, Calif.
5th Annual Short’s to Short’s Paddle; Bellaire, Mich. Right Brain Brewery — ACBW Firkin’ Friday; Traverse City, Mich.
3rd Annual Ameri-CAN Canned Craft Beer Festival; Scottsdale, Ariz.
HopFest Kansas City 2013; Kansas City, Mo. Brewers Association of MD “Maryland Craft Beer Festival”; Frederick, M.D. 2013 Wort Transformation Awards Ceremony; Papillion, Neb. Third Annual Brews with Attitude Craft Beer Festival; Tampa, Fla.
Third EVER Mother’s Day Festival; Springfield, Mo. American Craft Beer Week — Spokane Style! ; Spokane, Wash.
Elevation Beer Co. — Chef vs. Chef; Louisville, Colo.
Brewery Rickoli American Craft Beer Week Releases; Wheat Ridge, Colo.
Crow Peak Night at the Ale House; Rapid City, S.D. Roughtail Oaked Imperial Black Rye Ale Release at Tapwerks; Oklahoma City, Okla.
Shmaltz Brewing Media Ribbon Cutting Ceremony; Clifton Park, N.Y.
Portsmouth Brewery — Brewing with Botanicals; Portsmouth, N.H.